Sometimes projects come about in odd ways. For example, last year I bought a shirt I liked, then immediately got a stain I cannot lift up by the neckline. Fast forward to this spring, when a knitting friend and I did a yarn swap and I ended up with a pretty ball of Cotlin by Knitpicks, in whisper. I decided I wanted to make some sort of springy neck thing to wear over the shirt to cover up the stain. Of course once I found the perfect pattern, Saroyan by Liz Abanante, I realized I needed to buy more than one ball of yarn. So I bought two more balls of yarn, knitted the project, then put it on and decided I no longer liked that shirt with the stain. Or at least not with the pants I was wearing. Which might eventually mean that I need to buy new pants, but today it just meant that I wore the scarf with a different shirt. A happy ending! It is an unfortunate truth for me that I really love wearing scarves but I do not love knitting them. I get so impatient doing the same things over and over! But I really wanted a scarf to wear with my purple coat, so I gritted my teeth and made this one this winter. 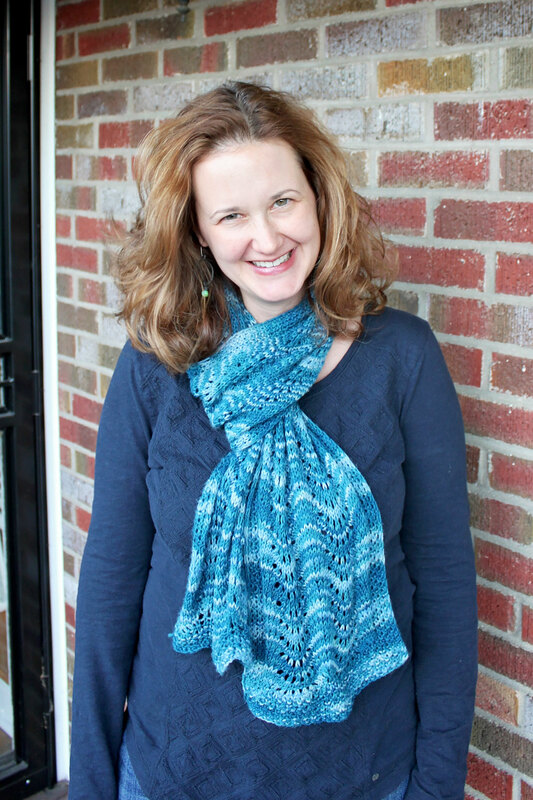 It was worth it–I love this squishy, warm scarf! This pattern suggests using two self-striping yarns. One of my yarns, Chroma worsted in Avalon, self-striped but my other, Preciosa Tonal in Stormy, changes colors but not exactly in stripes. They worked well here anyway. I used the ZickZack scarf pattern but changed it a bit by doing yarn-overs (thus making eyelets or holes in the scarf) instead of knit-front-and-backs. Another One-Skein Wonder project! This is the Marialis scarf from the Designer book. I made it out of Knitpicks sock yarn, Felici I think, but it was a close-out color that had been in my stash a while. I don’t like to knit scarves (had only knitted scarves for children) because I can crochet them so fast and scarves are boring, but I really wanted to try one of the lacy, lightweight yarn patterns that had been catching my eye. I finished this in two weeks and literally picked it up and knitted one repeat every time I had a chance to sit down. 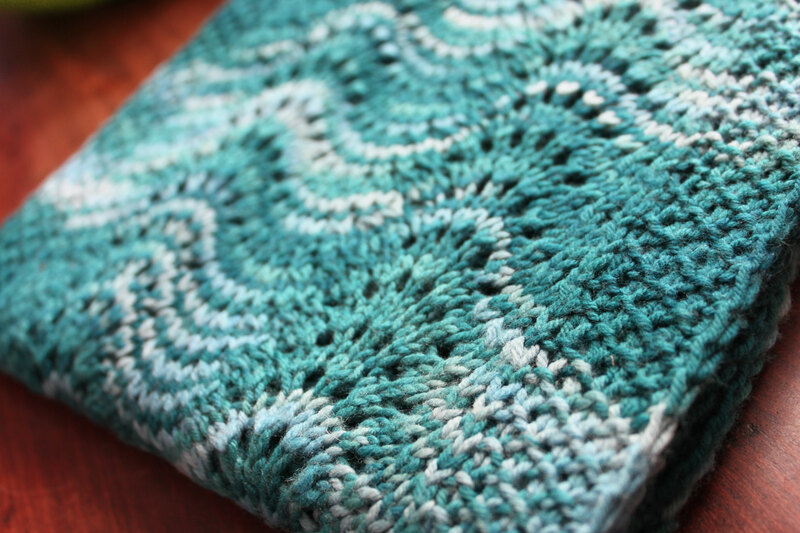 Load the dishwasher–knit a repeat! 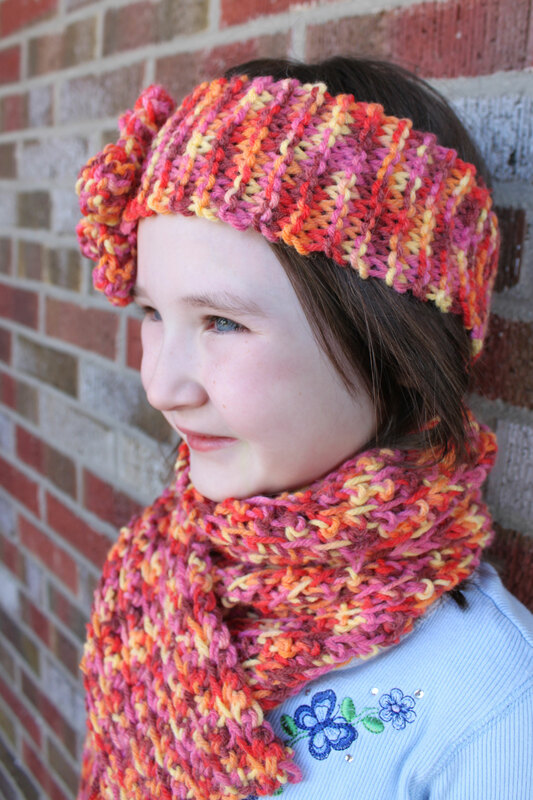 Bath a child–knit a repeat! 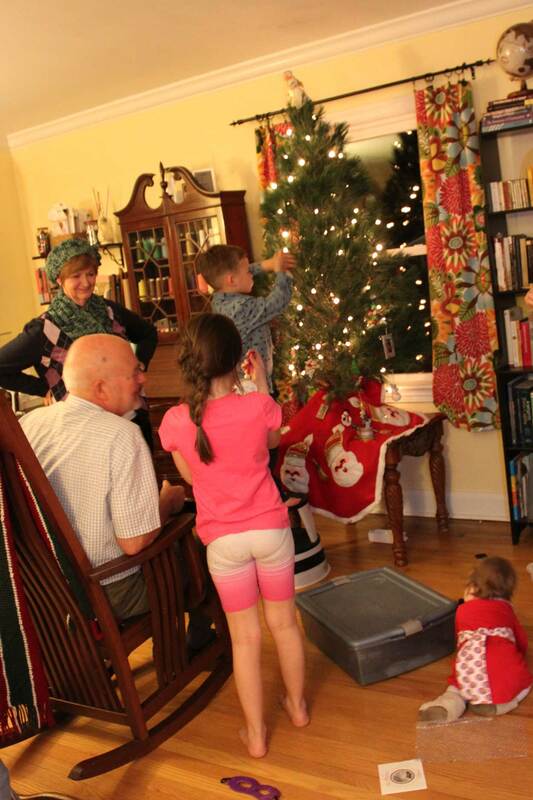 Feed the dog–you get the idea! I took to shouting out numbers after every repeat, just so I could know I was making some progress. It was totally arbitrary, because the pattern just says to “knit to desired length,” and I ran out of yarn at about the right length, but it was a mental boost to count my repeats. Even baby Daphne started called out “yeah!” along with my other kids to cheer me on when I yelled a number. This game was probably the only thing that got me through the whole thing, because now I can confirm that I don’t like knitting scarves. It’s just boring. Anyway, this one was worth the trouble. 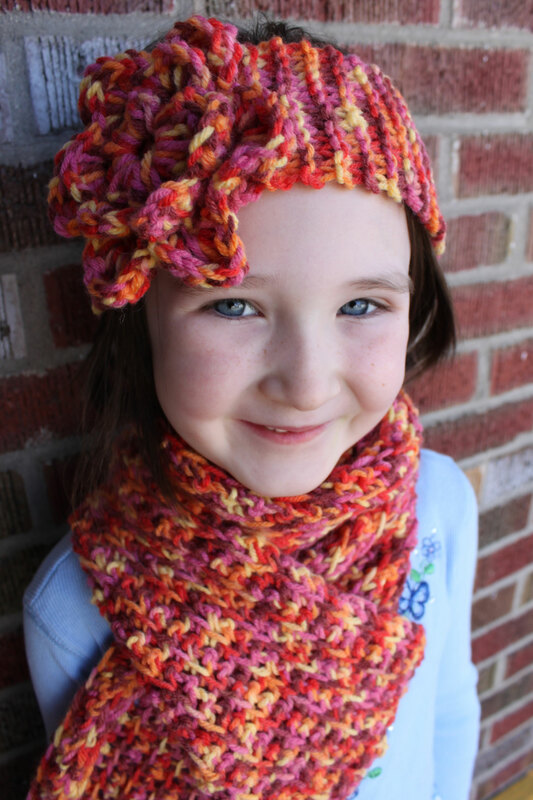 The pattern is very pretty and the yarn is soft and warm around my neck. The sock yarn has a lot of nylon in it, I think, so the lace has tendency to curl up a little against my warm skin and not lay out flat like I blocked it, but it still looks nice. 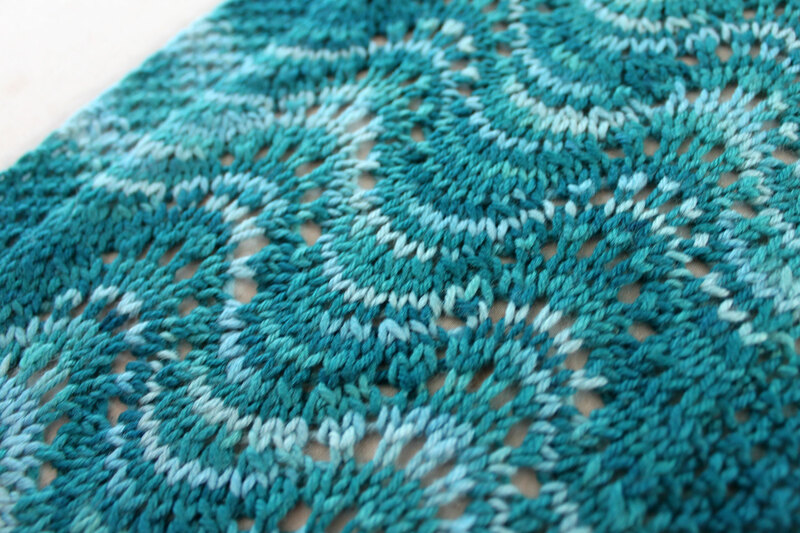 The color pattern of this yarn worked really well with this lace, which was just luck but made me happy. Welcome to Yarn Project Week! All three of my posts this week are going to be about recently-completed knit or crochet projects. 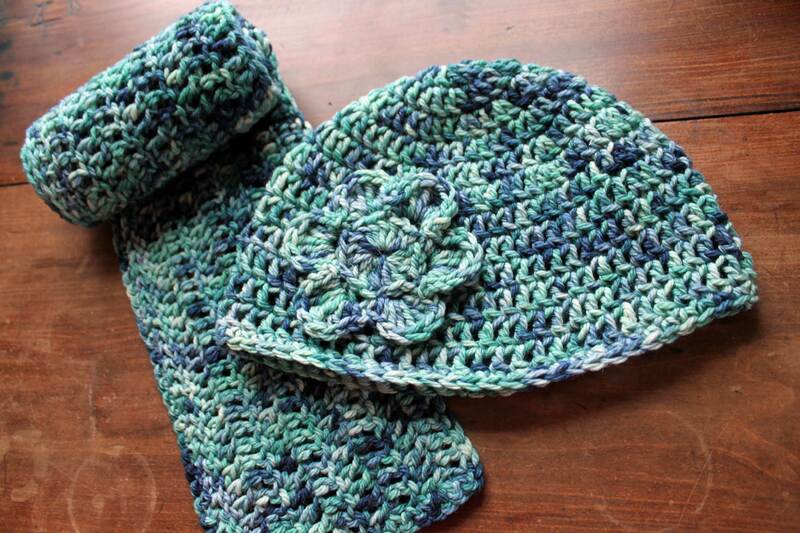 This is a scarf and earwarmer set I made for Dorothy and me to share. I purchased fantastic yellow polka-dot rain boots at Costco last fall, but somehow I never know quite what to wear with fantastic yellow polka-dot rain boots. I decided I needed a scarf that would tie in some of my more sedately-hued shirts with the bright boots. This wool-acrylic blend yarn fit the bill perfectly. I began knitting a scarf using a rather fussy wave pattern, then realized I was totally wasting my time with such detail when the focus would be on the colorway–and the boots–anyway. So I unraveled it and crocheted the whole scarf on a great big size K hook in the time it took to knit about four wavy inches. (I crocheted in front loops only, which gives a sort of ribbed look.) When the scarf was done and it was clear that Dorothy was even more into than I was I decided to add an earwarmer to make it a set she could wear. I didn’t use a pattern, just knitted (knooked) each row until I had a head-sized band, sewed it up, and added a crocheted flower. It’s a soft, warm, happy set. We’ve each worn it and enjoyed it, me just the scarf with my now-coordinated boots, and she the complete set.